For a fourth straight year, H.J. Martin and Son has been recognized as one of the foremost specialty contractors in the country, earning a place on the prestigious ENR Top 600 Specialty Contractors list. The company ascended 42 spots over its 2016 ranking, sitting at No. 174 in the 2017 index, published in the October 23 issue of Engineering News-Record. The upward climb was driven by the completion of a major project for a nationwide insurance company by the Glass & Glazing division, an uptick in work for national retailers and the start of the largest drywall project in company history. The Glass & Glazing division of H.J. Martin and Son remains a national leader, ranking No. 20 among Glazing and Curtain Wall firms in this year’s ENR list. Within the state of Wisconsin, H.J. Martin and Son remains one of the top specialty contractors. The company was ranked fifth in the state, behind only Faith Technologies of Menasha (33), J.F. Ahern Co. of Fond du Lac (67), Azco Inc. of Appleton (69) and Ryan Inc. Central of Janesville (159). Ryan Foley, vice president of field operations for H.J. 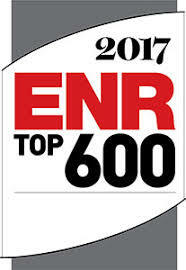 Martin and Son, was recognized as a thought leader within the ENR story accompanying the rankings. He was one of five construction executives tapped to address the topic of what companies are doing to mitigate present and future worker shortages in the industry. The ENR rankings were based on 2016 construction revenues in ($) millions from specialty contracting in a prime or subcontracting capacity.